Fixes structural problems such as damaged or missing teeth and restores their proper functioning through the use of dentures, partials, crowns, bridges, and dental implants. Root canal therapy is needed when the nerve of a tooth is affected by decay or infection. In order to save the tooth, the dentist removes the infected and injured tissues from within the tooth, cleans the tooth, and fills it with a medicated material. We then cap the tooth with a restoration, such as a dental crown, to return the tooth to its original shape and structure. In most cases, a root canal can be completed in one or two visits. Although these treatments are notorious for being painful, our team works hard to ensure that you are comfortable and relaxed throughout your entire treatment. Having a root canal done on a tooth is the treatment of choice to save a tooth that otherwise would die and have to be removed. Many patients believe that removing a tooth that has problems is the solution, but what is not realized is that extracting (pulling) a tooth can be more costly and cause significant problems for adjacent teeth. 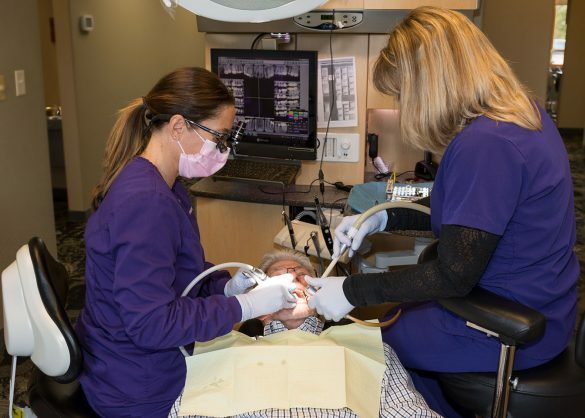 Root canal treatment is highly successful and usually lasts a lifetime, although on occasion, a tooth may have to be retreated due to new infections. To learn more about root canal treatment, we welcome you to contact Grand Dental Center today at 218-326-0339. We are committed to restoring your smile’s health. Call Grand Dental Center today at 218-326-0339 and schedule a consultation to learn what the best dental treatments are for you. Whether you need a family dentist or you suffer from complex dental issues, Dr. Lisa Johnson and Dr. Leanna McBride are here to help you.